Doom is clearly the running theme with this week’s batch of reviews. WOLF COUNSEL is a Swiss band that formed in 2014. 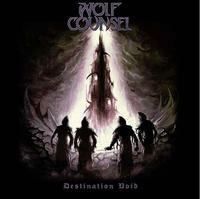 “Destination Void” is their fourth full-length, a true testament to their eager and ready work ethic. This is true Doom played by true Doom heads for true Doom heads. Sit back, inhale, let the feeling overcome you as the music swirls around your occipital cortex and steadily makes its way to your hippocampus. “Nazarene” kicks off the album with some initial angular chords over steady double bass creating a mood that feels both dire and cerebral. When the verse section begins, the singer is immediately reminiscent of Wino from THE OBSESSED and SAINT VITUS. In some ways, he also favors the style of J.B. Christoffersson, singer of GRAND MAGUS. When the bass plays low, ringing chords, the earth quakes and when playing more melodic higher up the neck, clouds part to allow it to ring through. “Nova” follows and expands the vision previously created. Highlighted by thick palm-muted chugs and expansive slides, one cannot help but enjoy the riff fest. Close your eyes and allow the music to take over and preside over your imagination. Clearly, these guys are all about the atmosphere. The sixth track, “Tomorrow Never Knows,” erupts with an entrancingly-played, grooving bass line in the tradition of greats like Geezer Butler and Steve Harris. When the guitars join in, its heaviness is fully realized. Later in the song, the bass is left to meander on its own. As such, it blazes a trail exploring a path of notes both logical and dazzling. The guitar proves to be tasteful as overplaying is abstained from and instead choosing to shower the song with elongated chords draping overhead. The final track, “Staring into Oblivion,” causes one to be caught up in the moment not realizing this is the longest song on the album, one second shy of ten minutes. It serves as a resolute, broadly-painted summation of the band’s overarching musical idea. The main groove is a mid-paced affair similar in tempo to a classic like “Sweet Leaf,” though it doesn’t come across quite as choppy. The drums keep things moving for the flowing bass and monolithic guitar work. The solos are a smash up of pure Blues, psychedelic improvisation, and metallic thunder. Overall, this final track turns out to be vital to the band’s ethos. It would be accurate to classify this as modern Doom. It bears the marks of the classics like SABBATH and PENTAGRAM, low and slow, and also at times wanders into more epic territory a la CANDLESMASS. The music is lower and dirtier, though, hence the modern tag. The guitar is rich with distortion breaking up fully, ideally pursuing an organic sound. There are no fancy effects or tricks, just a tube amp cranked to eleven and maybe an overdrive for solos and heavier parts. The band successfully creates a cohesive sound in perpetuating their forward-thinking concept steeped in rich tradition. These four Swiss guys keep the Doom flames sizzling and steep.